It's Monday, so typically I'm all blah because my weekend is over. BUT, my Eagles are going to the Super Bowl, I got some new workout shoes so I'm hype to get my workout in after work, I meal prepped for the entire week because I'm forreal doing this sugar detox, so basically I'm going to be a major #Girl Boss this week. 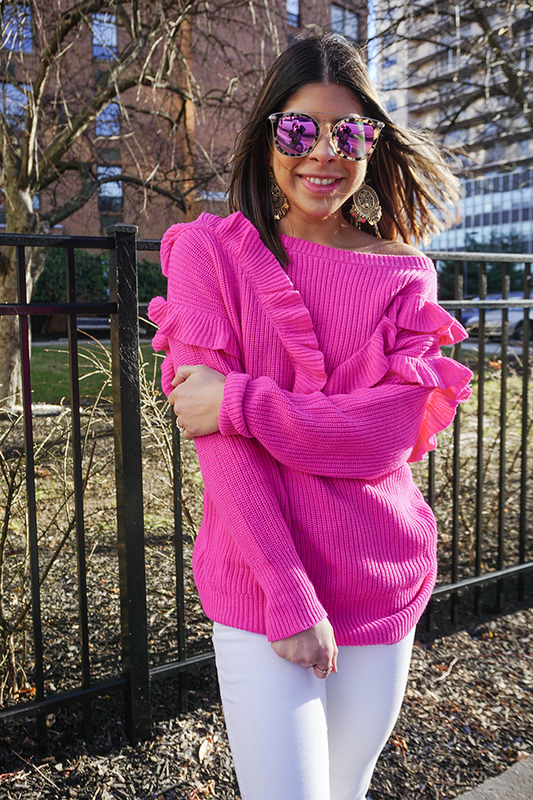 Today on the blog I'm sharing with you guys this super fun sweater. I purchased it back on Black Friday and I don't know why it took me so long to style it. I'm loving all the pink and ruffles! I thought it paired perfectly with a pair of white denim and flats, but when the weather gets warmer I'm going to try it out with a leather skirt for a fun little flirty look.